Everyone needs a clubhouse! You can build your own backyard shelter, retreat, or clubhouse even if you have never built anything before. The clubhouse above was built in 1959 by three kids aged 8, 9 and 11, with no money or help from grownups! I know; I was the 11-year-old who took this picture. I'm sharing here what I have learned since then. Readers of all ages are welcome to comment with their own ideas, pictures or stories. To help you on your way, I've written a book titled "Keep Out! 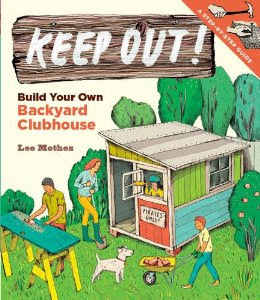 Build Your Own Backyard Clubhouse", which is available through bookstores or at Amazon.com . Many of the items I post here are also in the book. See the houses hanging over the surf! 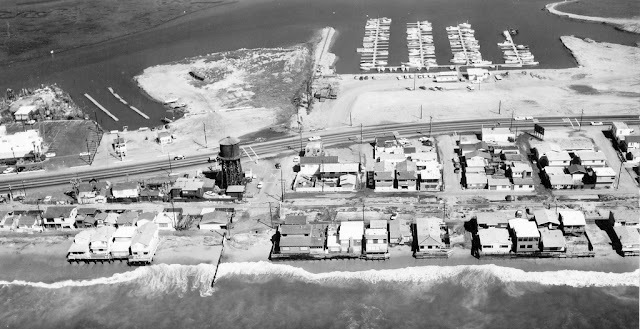 See the Pacific Coast Highway behind the houses. In between is our neighborhood, my whole world for a while. If you look just across the street (to the right) from the water tower, you'll see a fenced yard with a car in it. Next to the car is a little gray box-- our new clubhouse built against the fence. It was probably a school day otherwise we'd be playing there, or else watching the waves hitting the houses! This is your guide to building your own outdoor shelter, no matter what your age or carpentry background might be. If you ever had the desire to build your own private hideaway, now you can with these simple step-by-step instructions. Click the cover image to order this book on Amazon, or contact me at mothesart@gmail.com to get a signed copy. I welcome your comments at any time!